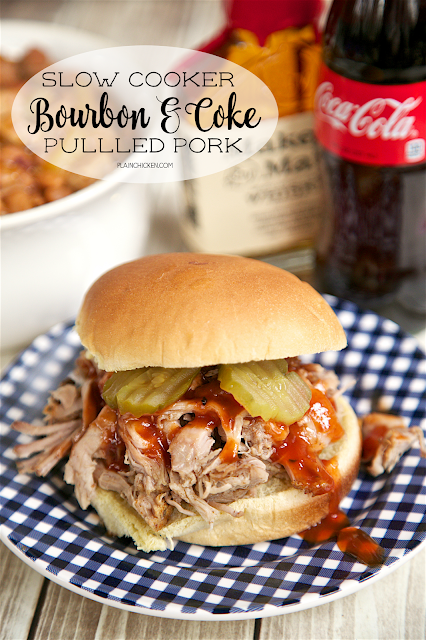 Slow Cooker Bourbon and Coke Pulled Pork - only 4 ingredients! Pork shoulder, bbq seasoning, Coke and bourbon. This was CRAZY good! We served this on buns with some bbq sauce and pickles. Would also be good on nachos or on top of a salad! One of our favorite slow cooker pulled pork recipes is made with Coke. Our favorite cocktail is a bourbon and Coke, so I decided to add some bourbon to our favorite recipe and see how it turned out. The answer? Ridiculously good! This recipe couldn't be any easier. Just dump everything in the slow cooker and let it do all the work. The pork cooks all day and is perfectly tender by the time it is served. 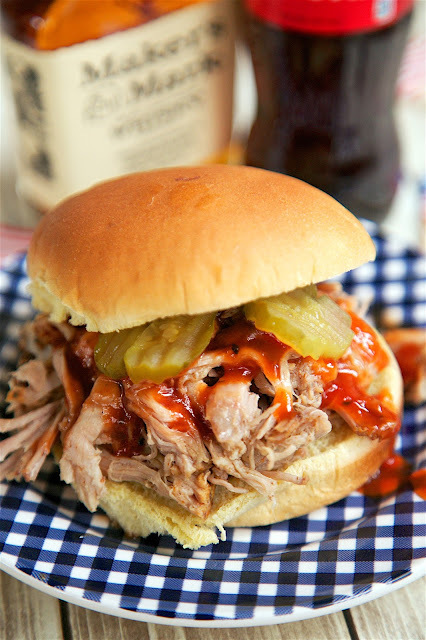 This pork is good plain or with your favorite BBQ sauce drizzled on top. We served this on buns, but it is also great on top of nachos or a salad too! This makes a lot. You can freeze the leftovers for a quick meal later. I like to use the leftovers for Brunswick stew (one of my favorites). Cheers!! Sprinkle BBQ seasoning all over pork shoulder. Place pork in 6-qt slow cooker. Pour Coke and bourbon over pork, cover and cook on LOW for 8 to 10 hours. Shred pork with two forks. Serve on top of hamburger buns with BBQ sauce and pickles. I want to try this recipe, but what is"BBQ seasoning"? I also had no idea what it was but I found McCormick brand Grill Mates Barbecue seasoning in the seasoning aisle at our local grocery store (that was the only brand they had). It's cooking for dinner tonight! Making it this weekend with some baked beans and potato salad. Can't wait!